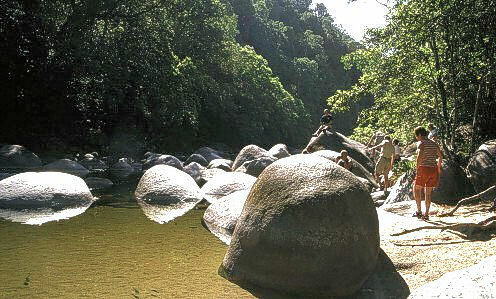 There are impressive pictures of Mossman Gorge around, but they're certainly not done during low water level and with a travel group. Even when touring alone this might be difficult, as we were the first bus of many. 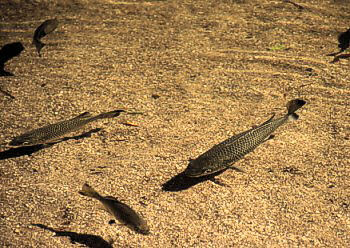 The water of the river was crystal clear, so clear the fish seemed to hover over dry ground. Mitch, a visitor of this site, wrote me they were Jungle Perch, Kuhlia rupestri. As someone with much experience and knowledge in Australian freshwater fish, I can assure that the fish in the picture are indeed jungle perch. Their scientific name is Kuhlia rupestris and they are a member of the Kuhliidae family. They are quite a beautiful fish species, found in some of the most magnificent rainforest river habitats in Australia. A few keen fishermen revere catching them on a catch-and-release basis on lures equipped with barbless hooks. They are a smallish fish, maximum size is about 50cm, but they commonly reach about 40 cm. They are a generalised predator. They migrate up to the upper reaches of rainforest rivers where they live for most of the year, but during part of the summer they migrate down to the estuaries to breed. They are only found in rivers on the north-east coast of Australia. They were originally found the length of Queensland's east coast as well as the very northern parts of the New South Wales coast, but have disappeared from the lower half of their original range due to dams and weirs blocking the breeding migrations of adults and the upstream colonisation of juvenile fish, and severe habitat degradation by poor farming and land management practices.